A VARIATION of the overhead cast, known as the double haul, is the final step in increasing line speed and thus adding length to your casts. The faster a fly line moves, the more momentum it has. Greater momentum allows you shoot longer lengths of line. The double haul is used for long casts, over 60 feet, and/or when there’s a lot of wind because greater line speed will overcome either obstacle. The double haul can be done efficiently only with weight-forward or shooting-head lines. 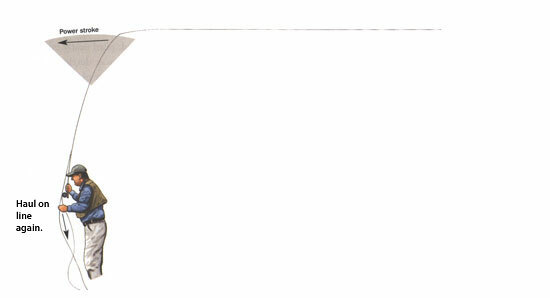 Both of the lines utilize about 30 feet of head or thicker line; the remainder of the line is thin-diameter running line. It’s easy to see this junction in a shooting-taper line, because the head and fly line are different types of materials, and sometimes different colors. With weight-forward lines, this junction is not immediately apparent, because the head and running line are continuous, the demarcation being where the head tapers down quickly, about 30 feet from the tip of the line. It’s important to find this point with either type of line. You’ll use the head to load the rod, while the running line will be pulled through the guides by the forward momentum of the head. The double haul, like any other cast, begins with the rod held low. Make sure there is no slack in the line and the stripping hand is close to your rod hand. I’d also recommend that you practice this cast with an 8- or 9-weight line. The extra line mass helps you feel the timing of the hauls — and besides, most times you use this cast, you’ll be using a bigger rod anyway. Start the double haul with about 35 feet of line on the water in front of you. Lower your rod tip to about 2 feet above the water and eliminate any slack by stripping in some line, or else by making a single forward cast. Begin the forward cast as if you were going to pick up a lot of line, bringing your arm up as you cast, letting your elbow come up above shoulder level. Your line hand should be holding the line tightly, quite close to the stripping guide. 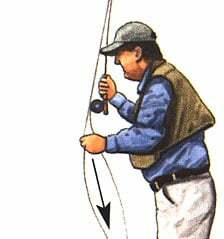 As you make your power stroke, haul your line hand down toward your waist. Watch the fly line; as soon as all the line leaves the water, haul on the fly line by bringing your line hand down and to the side forcefully. A 1-foot haul is about right to start. As soon as you complete the haul, toward your waist, let your line hand drift back alongside your ear to the stripping guide. The line that you hauled will become part of the backcast. Let the rod tip drift back to 2:30 (almost horizontal) as the line straightens behind you. Use a normal forward cast to complete the entire process. This is a single haul. It can come in handy all by itself if you have the wind at your back and you’re having trouble straightening the backcast. After you haul, let your line hand drift back so that your hands are almost together. As you begin your forward power stroke, again haul down forcefully with your line hand. Once you feel comfortable with the single haul, try a double haul by making a backcast and haul, but make the same hauling motion on the forward cast, at the same time you complete your power stroke. Now you’ll haul by bringing your line hand back toward your waist. When the line hand reaches your waist, the rod tip should be at about 10:30. 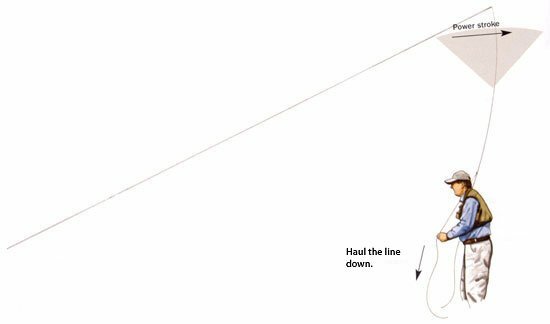 Your casting arm and the rod tip should be one straight line pointing above the horizon. Now, release the line with your line hand. Because you didn’t have any slack in reserve, the line will snap against the rod with quite a bit of power and fall to the water. As the casting loop begins to unroll in front of you, release the line. The line will then shoot through the guides with ease, much easier than if you did not use the double haul. If you have problems putting this together, and most people do, go back to using a rope on the ground alongside you. Turn the cast over 90 degrees, make a single haul, and let the line fall to the ground. Make sure it lies straight along the line behind you. Now make a forward cast with a haul, again striving to keep the line on top of — or at least parallel to — the rope. Now practice the double haul with 20 feet of slack line held below your stripping hand, piled neatly on the ground. The powerful line speed you’ve developed hauling, combined with the high trajectory of the rod tip, will allow you to shoot great lengths of line. The high rod tip is essential because, unlike any other type of forward cast, you are actually throwing or propelling line through the air. If the rod tip ends up too low, everything will pile up into the water. With a shooting-head line, it’s possible to shoot 60 to 80 feet of running line on a single cast. Running line has less friction and air resistance than the back end of a weight forward line, so it travels farther. When using a shooting head, make sure that the last couple of inches of fly line are just inside the guides. Otherwise, you’ll form a hinge at the junction of the fly line and the running line and lose a lot of casting power. Fly fishers using shooting-head lines often hold the coils of running line in their teeth or coiled in a stripping basket attached to the chest. In a boat, shooting line can be held in a plastic bucket at your feet. For optimum performance, you should get the kinks out of shooting-head running line. Point your rod tip at your fishing partner and have him or her pull on the end of the running line as he walks away from you. If no one is around to help, you can hook your front loop over a branch or nail and accomplish the same thing. The double haul and shooting-head lines are both designed for one purpose — distance. Neither will straighten a delicate 12-foot leader. They should be used primarily when it’s necessary to cast consistently over 60 feet — most often in big steelhead and salmon rivers, lakes, and in saltwater fishing. Sometimes in trout fishing, though, the extra line speed from a single or double haul will help. I’ve found it useful when throwing a big strike indicator with lots of lead on the leader, or when trying to cast into a very stiff wind.